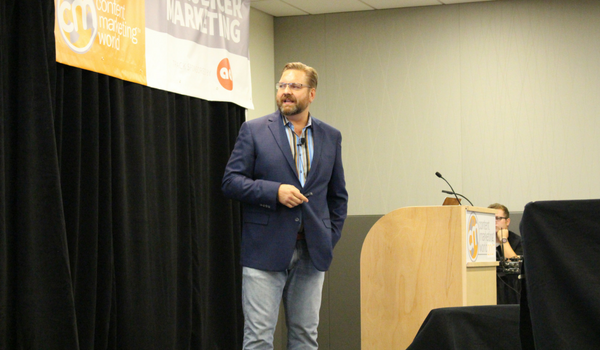 It was all aboard the Content Marketing World Enterprise Wednesday morning, as TopRank Marketing CEO Lee Odden took marketers to the not-so-final frontier of marketing: influencer marketing. Lee’s session, “Big Brand Influencer Marketing: Trends & Best Practices,” had the flight deck packed with eager marketers from brands big and small as well as agencies, all looking for insight to define, refine or inspire their influencer marketing journey. While Lee covered influencer marketing trends, tools and interesting B2B and B2C case studies, much of the presentation focused on five best practices for creating a dynamic influencer marketing program with the perfect balance of great content and strong influencer relationships. What are those five best practices? Read on to find out. Goal setting is part of a responsible marketer’s DNA. Your objectives are the foundation of your marketing strategy, guiding every decision and tactic that comes next. When it comes to goal setting for influencer marketing, Lee believes that means thinking about all of the possibilities and then drilling down into specific, measureable goals. As Lee said: “There are a lot of cowboys out there. … A lot of people are just shooting from the hip when it comes to influencer marketing.” When it comes to engaging with the influencers you want to create relationships with, you should absolutely be a little wild and free to pique interest, but at the right times. Of course, these steps are a bit nuanced and not one-size-fits-all, and need to be tailored to your brand, objectives and resources. But either way, it can serve as a helpful guide. Lee is an avid fan of co-creating content with influencers. As he’s been known to say: “If you want your content to be great, ask influencers to participate.” Influencers add perspective, insight and credibility, and in return you get to create an awesome piece of content that makes them look great. For co-creation magic, Lee’s top tips were picking a very specific topic so you can easily match the best-fit influencers, and weaving influencers into your content planning. “You always make sure that your content is accountable to targeted keywords, so why not also make your content accountable to influencers?” Lee asked rhetorically. At the end of the day, most marketers hope their influencer relationships and the content they’ve built with influencers is seen. And that’s where amplification comes in. As for some best practices for this best practice, Lee offered up several. My favorite was openly sharing your content and marketing objective with the influencer. While some marketers may hesitate to do something like that, Lee believes that cluing influencers in on the purpose will give them the opportunity to be more effective. Even if you were unable to attend CMWorld, you can still get insight and inspiration from Lee’s session. His presentation is available on SlideShare. The post 5 Best Practices for Enterprise Influencer Marketing #CMWorld appeared first on Online Marketing Blog – TopRank®.